Heard about Stampin' Up! Paper Pumpkin Kits? Want to try it? Check this out! Paper Pumpkin New Subscribers! 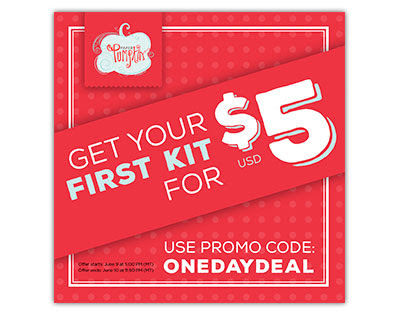 Get YOUR first kit for just $5! Offer starts Thursday, June 9, at 7:00pm (eastern time) and ENDS Friday, June 10 at 1:50am (eastern time)! Promo code “ONEDAYDEAL” Talk about a Flash Sale! AND, Subscribe with me as your demonstrator, for a chance to get this past kit FREE too! Pocketful Of Cheer was the March Kit! and you're in the running! Contact me with any questions! Subscribe with me as your demonstrator, for a chance to get this past kit for FREE too! Contact me with any questions! Awesome deal! Here’s a quick video of Carrie Cudney from the home office of Stampin' Up! So excited about this amazing offer One Day Only! First-time subscribers can get their first kit for $5.00! This “one day deal” starts at 7:00pm eastern time on Thursday, June 9 and ENDS Friday, June 10 at 1:50am eastern time! Use promo code “ONEDAYDEAL” Click HERE! No commitment-can cancel or pause at anytime! Available for month-to-month subscriptions only. So, grab YOU first Paper Pumpkin kit for practically pennies!